The first league game of the season saw Hayes travel to the Kent coast of Hythe. The Hayes captain Hannibal Quayle acquired the Squad vehicle to all travel down together. Ten men launched on along with team scorer and off we set via Orpington train station to pick up Private Gray who had gone walkabout surviving as a soldier of fortune in the east end of London underground - found on the wrong side of Network Rail's barriers and heavies to boot - Hannibal paid the penalty rail fare and packed the AWOL Gray onto the Burger Van to cut a chase onto the motorway to our Tom Tom'd plugged in, destination. We get to the ground, get changed, warm up; scratch up on the new rules for 2011 with the umpinos - take to the toss and Hannibal chooses wrong. Hythe fancy setting a formidable score on a firm pitch. Skipper Smith and ex Gravesender Maurice open up; with the latter mentioned stroking the first ball of the day to the boundary with ease. However the Beasties remove Maurice and regular Furnival in quick succession to leave the hosts in a spot of early bother. Smudger and 2011 Australian overseas debutant Chris Chello launch a counter attack and score freely both bringing up deserved half centuries from some good stroke play, particularly the pocket rocket Australian who looks a decent find by Hythe. AWOL and villager Gray enters the fray from the promenade end and removes both batsman, Smith looking a little unfortunate to be given out LBW; Chello really donating his wicket when a debut ton looked for all the taking. Picho and Watto made very useful contributions with some gifted lusty blows to the leg side boundaries to bring up 200. Having been reminded by the officials that there was only 10 minutes left before points penalties could be imposed; Quayle brought himself back to make up time and attempt to bowl the hosts out. It was all a bit of an unnecessary situation with the Hayes skipper joculating his arms to the pavillion for the next man to rush in to save a few seconds - a little bit to the consternation of the home side and haughty crowd inferring unsportsmanlike behaviour - in particular the brawler like man in the red shirt who was never without a pint in his hands - it was never of course intended to be unfair - the whole episode was a bit of a panic. So Hayes pull back and are very much in the game at half time dismissing Hythe for 210 - surely 50 or 75 runs less than the hosts would have liked after 20 overs in. The Hythe players gathered in the changing room and were geeing each other up for the run the the field with the odd ball scoreboard operater being particulaly vocal!! Game hogger Chello took the new cherry from Prommy end and immediatley showed some pace to surprise opener Whetren. Both Large and Chello bowled decent lines and flow of runs were hard to come by, with both Whetren and Bamber finding it difficult at times. Youngster but UNIT Hemphrey clocked up some pace too when replacing Chello. Having been hit for a towering six over wide long off by Whetren he next ball had him caught comfortably at mid on to make the breakthorugh following a fifty run opening partnership. Coulson and Bamber soon followed as Hythe created great pressure with discipline and some fine ground fielding. Taylor and Zippy Couldrey were trying to repair the damage but they too were to sucomb with poor shot selection putting the visitors in a terrible and hapless position to try and salvage a draw. It was not to be and part time bowler Furnival helped himself to a double brace of wickets with young Alex Bill picking up three wickets to give Hythe 20 points and a very good start to their 2011 campaign. 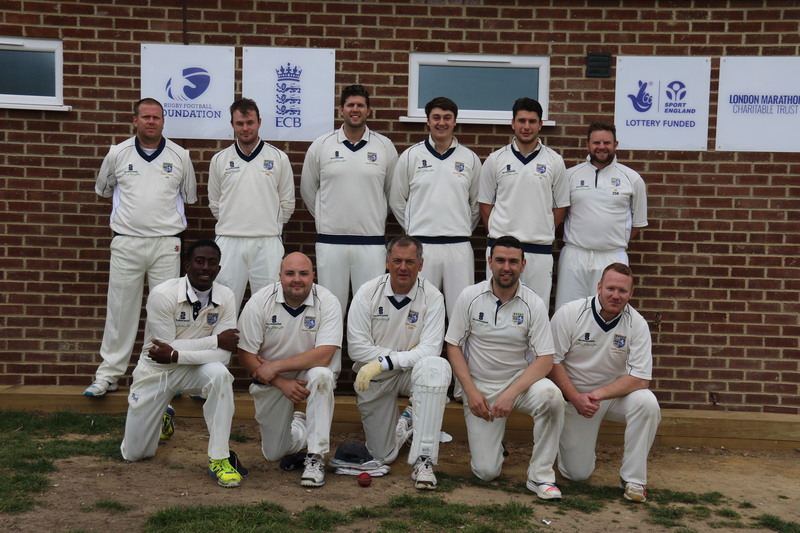 The Hayes team need to lick their wounds after a very disappointing display with the bat and must show character as well as skill when the Orpington gOnads arrive at Barnet Wood Road this weekend. Epilogue - The Party bus made its way back to North Kent via Hythe's Sainsburys and BP garage for some refreshments to consume on the journey home. Moments to note included Zippy consuming too much and having to relieve himself with the aid of a Pringles tube. The music was loud and the players let some steam off with particularly poor singing and chanting - someone also spotted the strapping blonde bird in the town pub who was earlier parading herself at the ground; good spot scorer!! We drop off at Cougar Central for one - then Hannibal Quayle takes a few of the soldiers of fortune to Pat's going the route to arrive right outside the door to greeting bouncers - the doors slide open and all bundle into the pub!! BTW - who let the dog out?